While drawing this a program about the royal wedding between the Danish crown prince Frederik and the Australian Mary started on TV. Mary have become a very beloved princess in Denmark. Unlike the French guy our queen Margrethe married, Mary was very quick to learn Danish and she just overall seems like a really nice lady. It may seem like a weird mix to have Sweden, Norway, Denmark and Netherlands together, that’s because those four royal families usually hang out together. 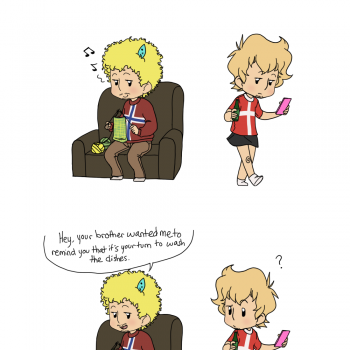 Am I the only one imagining Australia giving Denmark the protective brother lecture? Sr Netherlands is so cute! @UhhMaybe woah! That's so cool! wait................................... is that the only reason why Denmark helped her? @potatoe4life Nonetheless, it still works. This comic gave us the best shipping ever, AND Denmark got to bone!